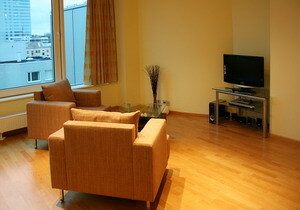 Tallinn Residence is an exclusive offering of luxury serviced apartments in Tallinn. Our serviced apartments begin with a liberating sense of space whilst giving you the freedom and convenience of your own furnished residence. With our Tallinn Serviced Apartments you receive a complimentary bottle of wine and we even offer free Tallinn Airport Collection. Our luxurious Tallinn Residence Apartments offer a real alternative to small soulless hotel rooms, by providing you a home away from home. Enjoy your stay! 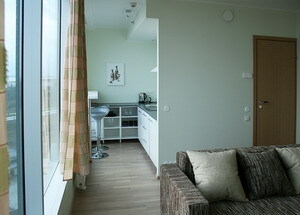 TRIUMPH PLAZA Rent a luxury studio apartment in the heart of Tallinn, with spectacular views of the city, just two minutes walk from Old Town. 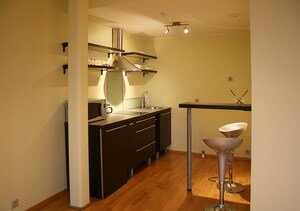 Stylish apartment 39. 6 square meters, just renovated with modern furniture, composed of a living area with 1 double size bed and chairs, a fully equipped open-plan kitchen, shower room, TV LCD, CD/DVD player, music centre, WI-FI Internet access and a 2-seater dining table; set on 8th floor with lift. Located within two minutes walk to Old Town with major shopping mall, finest restaurants, wine bars & clubs nearby. This is a non-smoking apartment. FAHLE APARTMENT A brand new fully furnished and equipped studio apartment in the Fahle building, a reconstruction of the former Cellulose Factory beside Tartu Road and 7 minutes away from the city airport. The name originates from the onetime great owner and manager Emil Fahle, who once revived production in the factory which was already on the verge of bankruptcy, and doing so became one of the most influential people of the first Estonian Republic. A spacious, lovely studio apartment set on 11th floor with lift, brand new, composed of 1 corner sofa bed for two, bath with shower, a fully equipped kitchen, Satellite-channel TV LCD, CD/DVD player, music center, WI-FI Internet access and a 2-seater dining table. There is also a fantastic view from the floor-to-ceiling window overlooking the Lake Ulemiste. Ulemiste shopping centre located nearby. This is a non-smoking apartment. 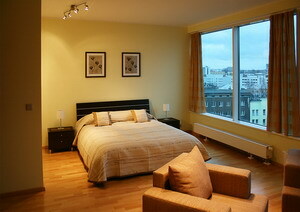 Bed linen and towels are provided for your use and changed every third day by our own maid service. Both apartments have a combined WC/Bathroom for your use. Maid service two times a week is included and there is also on-site security. Pred príchodom je možné požiadať o dodatočný vklad. Ak áno, budete kontaktovaní priamo po potvrdení vašej rezervácie. · A credit card is required as a guarantee ONLY. BALANCE TO BE PAID IN CASH ON ARRIVAL. · On arrival you may be required to provide photographic proof o your identity (e.g. a valid passport or photo-card driving licence); copies may be taken of these for our records. · All special requests made via this website cannot be guaranteed, if not confirmed and may incur additional charges. 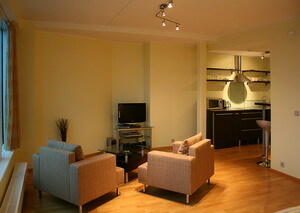 · Unless otherwise agreed in advance, all apartments must be vacated by 10 am (local time) on the due date of departure. If there is any delay in vacating the apartment beyond the agreed time, a full days rental may be charged to you for each additional days (or part thereof) occupation. 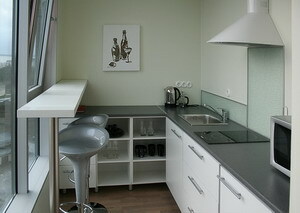 · Tallinn Residence is not adequately suited for disabled people and wheelchairs.